Every day across the web I see people spouting off about how bad President Obama is for the United States, how he's a socialist, how he's on a spending spree unlike anything we've ever seen, and how he needs to be voted out of office in November. "Anybody but Obama!" they cry. As some friends on Facebook keep posting about how Obama is one of the worst presidents of all time, I decided to take a look at the facts. I'm just an average citizen, with no Economics degree. But after spending some time with the reports, it became quite clear how untrue the the Republican accusations really are (which I always suspected). It would be great if we could have an honest conversation about the economy, the deficit, and what each party plans to do if they win in November. This is my attempt to have that conversation. We're living through the second worst economic downturn in the history of the United States. Things are getting better, but many people are still hurting. The scary thing is, it could have been much, much worse. 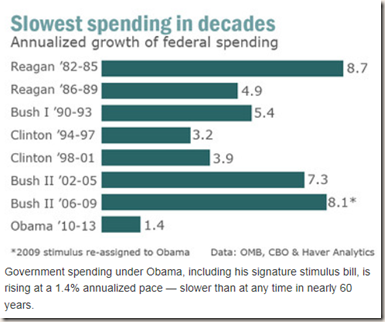 If anything's clear now, it's that Obama (and Congress) didn't spend enough on the stimulus package. But that's a different story. According to the same article: "What people forget (or never knew) is that the first year of every presidential term starts with a budget approved by the previous administration and Congress. The president only begins to shape the budget in his second year." The deficit: Who's really to blame? 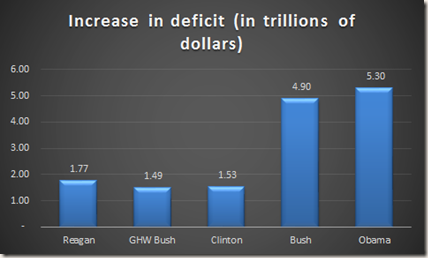 The deficit of the United States, at first glance, is something that seems pretty bad. But it's also not something that can be understood in a sound bite. 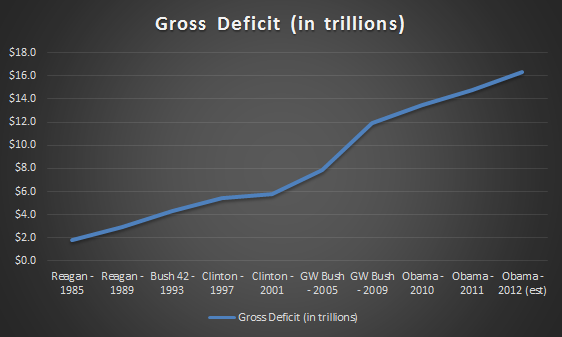 Since Obama took office in 2008, the federal deficit has gone up 50% (or $5.3 trillion). No matter which way you look at it, $5.3 trillion is a hell of a lot of money. But the thing you have to remember is that Obama started at the level that Bush had set ($4.9 trillion) -- and that the United States' economy produces $15 billion trillion in goods and services each year. 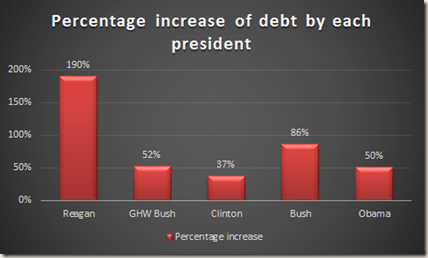 As you can see, debt under GW Bush (#44 as some call him) went up 86% in 8 years. 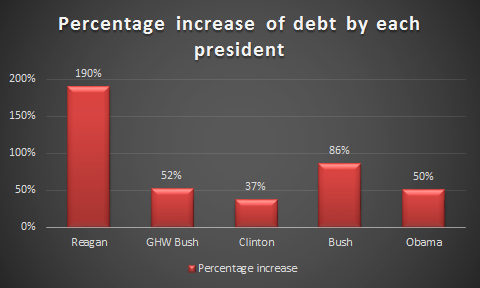 When Obama started his term, GW had increased the debt by $4.9 trillion in those 8 years -- and we were just entering some of the worst of the economic downturn. It's difficult to undo the momentum of that kind of spending. Even more difficult to cut back on spending when that's what actually needs to happen. But what's really revealing is the percentage increase that Reagan was responsible for: 190%! 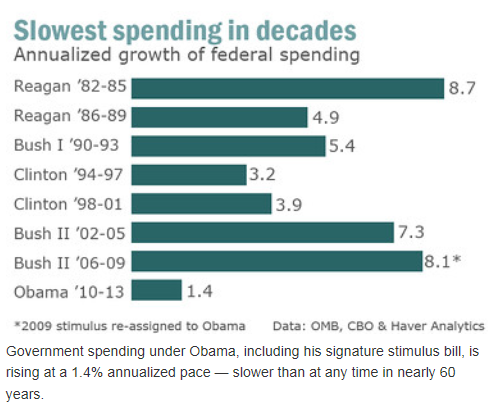 In the Republican revisionist history, Reagan has been anointed as the greatest fiscal conservative of all time. No, it's not as much total debt as Obama is responsible for -- but Reagan definitely turned the ship in the wrong direction. As quoted earlier, a president inherits his predecessor's budget during his first year. Let's look at the deficit and spending for each of a president's full fiscal years by each of his terms (and showing all three of Obama's fiscal years, including the estimate for 2012). 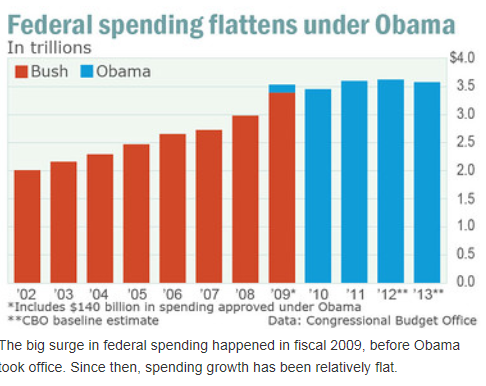 To be clear, Obama's first full fiscal year didn't start until 2010, even though he took office in 2009. What we see is that Bush was responsible for the huge increase in 2009 (with the bank bailouts--which needed to happen by the way). So instead of Obama being responsible for $5.3 trillion, he was actually responsible for $2.8 trillion -- and Bush was responsible for around $4 trillion. 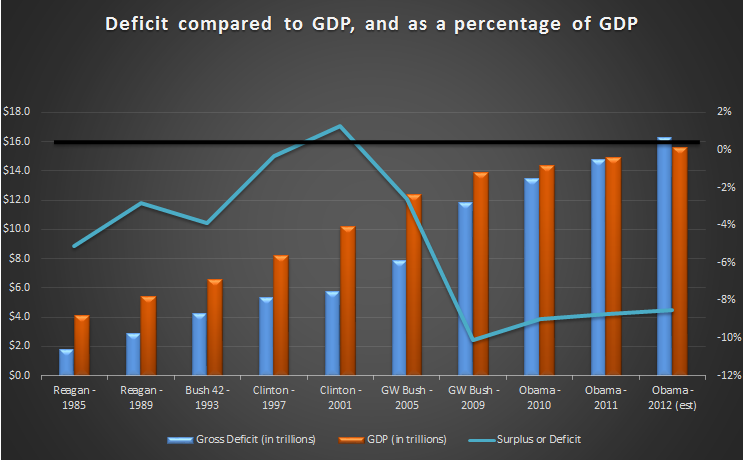 GDP was much bigger than the gross deficit during Reagan's time, and has increased with each president. 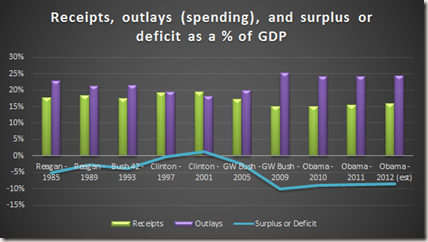 Reagan actually moved the deficit in the right direction during his first term -- toward a surplus, which is what that red line is at 0% -- but then took it the other direction in his second term. 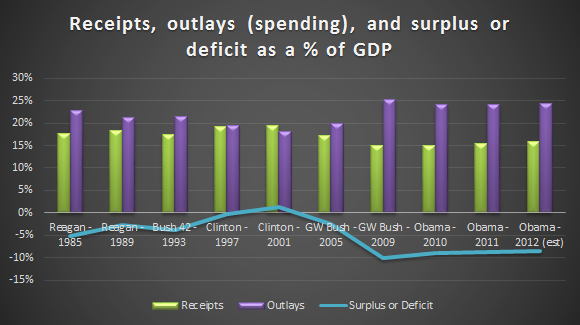 Bush 41 raised taxes ("Read my lips"), which actually moved the country closer to a surplus, which then happened under Clinton. Soon after Bush 44 took office, 9/11 happened. But then he also cut taxes and gave a refund to tax payers with the surplus money that had been built up. Once the Depression hit in 2008 and revenues (receipts) disappeared, the increase in the deficit accelerated. 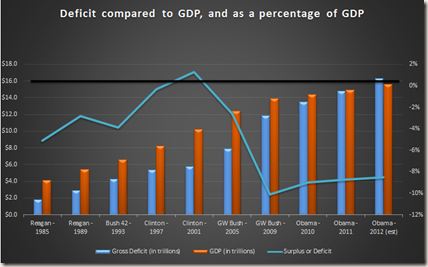 The change in the deficit since Obama's first full budget is flat. As you can see, spending shot up under GW Bush (44) during the economic crisis and has remained at around the same level since 2010. There has been a rapid increase in U.S. debt since 1980, but that rapid rise in debt didn't put us deeply in hock to the rest of the world. It did, however, make us vulnerable to the kind of crisis that struck in 2008. Krugman, Paul (2012-04-30). End This Depression Now! (p. 44). Norton. Kindle Edition. What I find incredibly hypocritical is the Republican Party's stance on spending and debt. Note that they didn't have a problem with GW Bush spending away -- but when Obama's trying to help pull us out of a Depression, they cry bloody murder. They want Obama out of office, regardless of whether it's their party that's to blame for the fiscal mess. 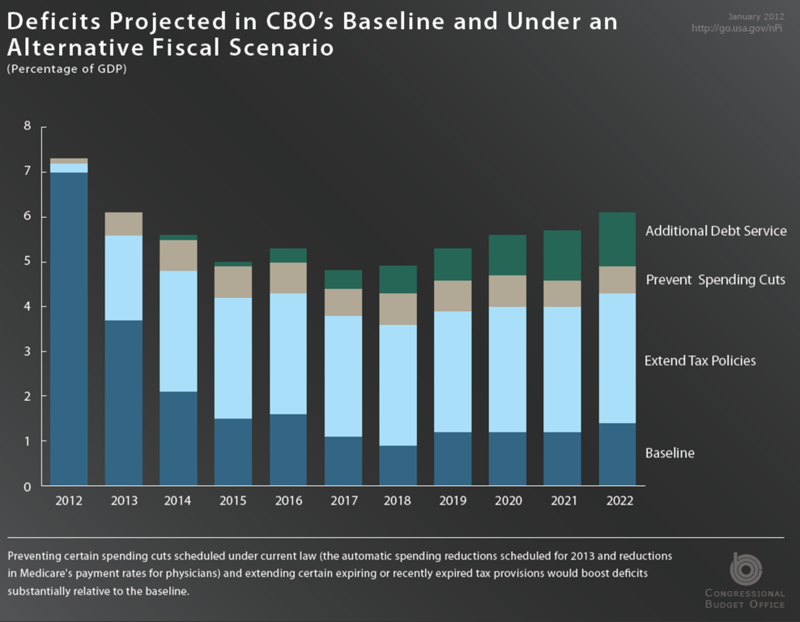 Take a look at the baseline in this chart compared to what happens if the Bush Tax Cuts continue. 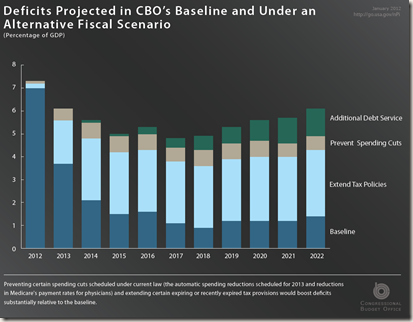 That alternative fiscal scenario is what will happen under Romney/Ryan (if they do what they say they'll do). So, there you have it. The past, the present, and the future. Where we go next is up to the voters. I for one hope that Obama wins, as it appears he's on the right track with the economy.